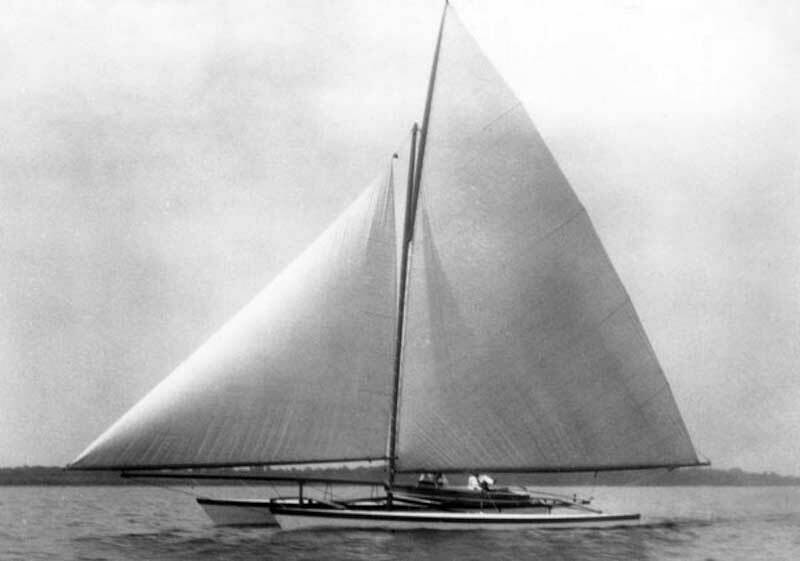 The AMARYLLIS was a 33 foot catamaran built in Rhode Island by the “Wizard of Bristol”, Captain Nat Herreshoff. Shortly after her launch in 1876 from the Herreshoff Boat Works, Captain Nat sailed his “cat” the 200 miles to New York City in the remarkable time of 14 hours, and was said to have chased down a steamer on Long Island Sound along the way and passed her while reaching across the wind at a speed of nearly 20 knots. He entered his double hulled craft in the Centennial Regatta of the New York Yacht Club, held in New York Harbor off of Staten Island. Class 3 was open to all boats between twenty-five and forty feet in length, and there were eleven starters in the race, including the best of the large-sized mono-hull sandbaggers of the time. In the first part of the race, the wind was light and AMARYLLIS lagged behind the other boats. If she was to place she would have to pass most of the fleet, but when the race was about half over, a lively breeze sprang up and AMARYLLIS sailed gaily through the fleet. She took off and fairly flew across the bay, and wound up winning by twenty minutes and two seconds over the next competitor, the famous PLUCK AND LUCK. Some in the class were left forty or more minutes behind. Immediately protests were lodged by several of the competitors. AMARYLLIS was ruled out of the class, and the prize was given to the second place boat PLUCK AND LUCK. The newspapers called AMARYLLIS nothing but a life raft and not a genuine yacht. The utter shock to the other contestants sailing much larger boats led to the barring of catamarans from conventional yacht races from that time forward. Still, there was a newfound interest in catamarans, and during the next ten years about twenty of them could be found prowling the Hudson River and the head of Long Island Sound. But it wasn’t for another 125 year until the America’s Cup competition was raced between multi-hull craft. In 2007, the average speed of the conventional sloops competing in yachting’s signature event was about ten knots – When the race switched to the new hi-tech multi-hull craft in 2010 the average hull speed quadrupled to forty knots!